With the local government elections approaching, the leaders of the Bengali and Rohingya communities in Karachi too have become politically active. Recently, many Karachi-based Bengali leaders gathered at a restaurant on Thursday to discuss the polls. The participants of the meeting, who belong to the Pakistan Muslim Alliance (PMA), a Karachi-based political party representing Pakistanis of Bangladeshi origin, decided that the Bengali community, along with the Burmese or Rohingyas who were living in the city for decades, would actively participate in the elections. Khwaja Salman, an elder of the Karachi-based Bengali community, who headed the meeting, said the PMA would forge an electoral alliance with the Pakistan Muslim League-Nawaz in the local government polls. “We are ideologically Muslim Leaguers and therefore we have decided to support the PML-N in the polls,” said Salman, who is the son of Khwaja Khairuddin, a staunch Muslim Leaguer and an ideologue who had served as the mayor of Dhaka in the 1960s. Khurram Shahzad, SM Farooq, Shams Alam, Dr Saeed, Asghar Ali, Dr Attaullah, Mian Hussain and Dr Kabeer were among the other participants of the meeting. Salman said their delegation had met the PML-N leadership in this connection and was also in contact with the other political groups including the Jamiat-e-Ulema Pakistan and the Pasban (Shafi faction). Although there are no official statistics available, interviews with Bengali and Rohingya community leaders and researchers suggest that there are over 1.6 million Bengalis and up to 400,000 Rohingyas living in Karachi. Although Bengalis and Rohingyas live side by side in dozens of shantytowns of Karachi, both communities are very different from each other linguistically as well as culturally. But the Rohingyas generally call themselves Bengalis. “It’s because they want to show that they have also migrated to Pakistan before the fall of Dhaka and it helps them get naturalised citizenships,” said Rana Asif Habib, a social activist who has worked extensively with the two communities. In Korangi and Malir districts, there are many neighbourhoods heavily dominated by the two communities including Ibrahim Hyderi, Arakanabad, 100 Quarters, Arakanabad, Chasma Goth, Burmi Colony, Ali Akbar Shah Goth and Zia Colony. They also live in large numbers in Ziaul Haq Colony in Gulshan-e-Iqbal, Machhar Colony in Keamari, Moosa Colony in FB Area and informal settlements in Orangi Town. Experts say that the migration of both the Bengalis and the Burmese had started in the 1980s, which continued intermittently until 1998 because of a liberal policy towards refugees during Gen Ziaul Haq’s military regime. Habib said the trafficking of Bengalis, especially women, was the very common at that time to provide cheap labour for the then flourishing textile and fishing industries. The political parties representing the two communities in the city include the PMA and the Pakistan Muslim League-Sher Bengal (PML-SB). However, the Rohingya community largely supports religio-political parties including the Jamaat-e-Islami, the Jamiat-e-Ulema Islam-Fazl and the Ahle-Sunnat Wal Jamaat. In the 2001 local government elections, several Bengali and Rohingya leaders were elected nazims and councillors at the union council and town levels in the areas of Karachi where communities were in majority on the tickets of different political parties and as independent candidates. “More than 75 people from both communities were elected in the 2001 local bodies’ polls and this had helped them in addressing the civic problems in their neighbourhoods,” said Salman. Salman and his colleagues had formed the PMA before the 2001 polls while Dr Saleh Zahoor, a leader of the Pakistani Bengalis Charitable Association, formed the PML-SB in March 2006. In 2002, the Burmese and Bengali communities had contested the general elections from the platform of their own political parties, especially the PMA and the PML-SB. The PMA had failed to win any seats, but managed to bag a significant number of votes from the Bengalis and Burmese living in Korangi and Bin Qasim. The PMA candidates had fetched around 5,000 votes each from NA-254 Korangi and PS-129 Bin Qasim constituencies, only from Burmese and Bengali neighbourhoods. However, after the MQM had formed a special committee for the Bengali and Burmese communities called the Pakistan Bengalis Action Committee (PBAC) in 2005, the PMA abandoned its activities. The PBAC, led by Shaikh Feroz, a former town nazim of Orangi, is now active in all the Burmese neighbourhoods of the city. Habib said political parties had also used Bengali groups to make their political gatherings successful. In January 2012, Bengalis and Rohingyas in thousands were gathered at Mazar-e-Quaid for Pervez Musharraf’s newly launched All Pakistan Muslim League. 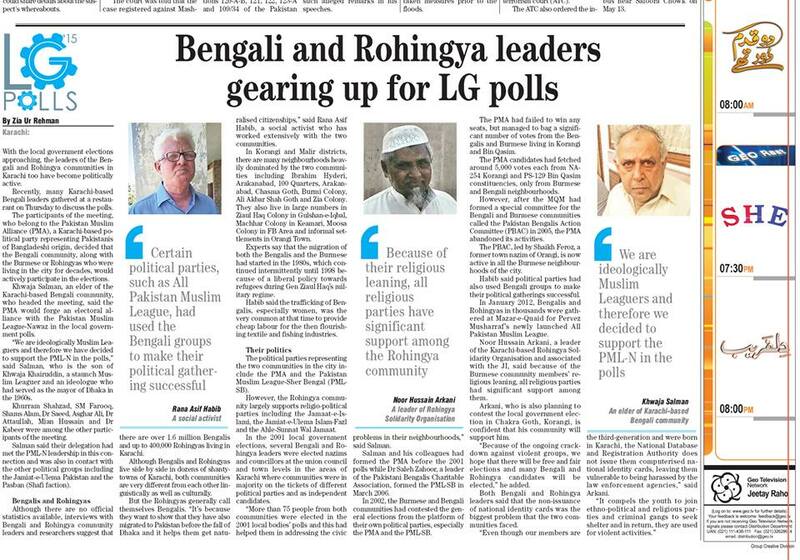 Noor Hussain Arkani, a leader of the Karachi-based Rohingya Solidarity Organisation and associated with the JI, said because of the Burmese community members’ religious leaning, all religious parties had significant support among them. Arkani, who is also planning to contest the local government election in Chakra Goth, Korangi, is confident that his community will support him. “Because of the ongoing crackdown against violent groups, we hope that there will be free and fair elections and many Bengali and Rohingya candidates will be elected,” he added. Both Bengali and Rohingya leaders said that the non-issuance of national identity cards was the biggest problem that the two communities faced. “Even though our members are the third-generation and were born in Karachi, the National Database and Registration Authority does not issue them computerised national identity cards, leaving them vulnerable to being harassed by the law enforcement agencies,” said Arkani.